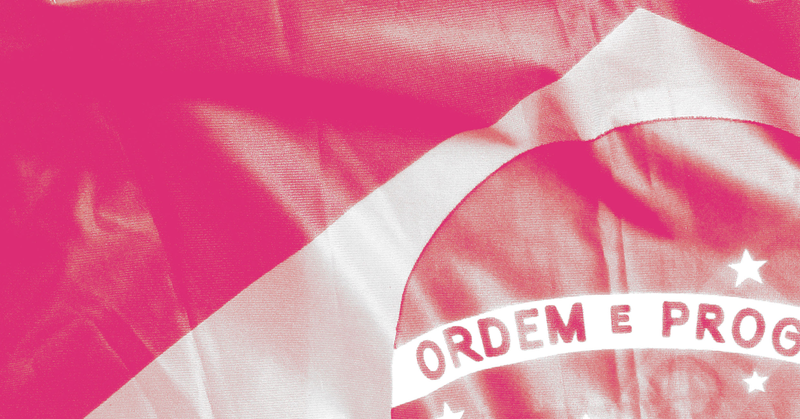 Brazilians are collectively the largest users of social media networks in Latin America. They actively participate in virtual communities, which is why Brazil is one of the most engaged countries in the world. In spending 3 hours and 40 minutes on average per day scrolling through timelines, Brazilians can certainly be called avid social media users. Although Facebook, with its 129 million users, is the most popular social network in Brazil, Instagram is catching up quickly. The social media network currently has 64 million users, which is more than 30% of the Brazilian population of 211 million (third globally behind the USA and India). Because of these numbers, I wanted to take a look at how Brazil’s biggest brands are performing on Instagram. This article will help you understand how these brands make use of their Instagram and which tactics work best for them - and might even work for you. The brands were picked from the Brandirectory Brazil 50 2018 list. Some of these brands do not seem to have Instagram included in their marketing strategies and, thus, did not post. These brands were, therefore, not included in the conducted research. That’s how I got to these 10 brands: Banco Bradesco, Banco do Brasil, Brahma, Havaianas, Itaú, Lojas Americanas, Lojas Renner, Natura, Petrobras, and Porto Seguro. The report is based on data from September 20, 2018 to October 18, 2018. Type of content posted The type of content posted the most by these brands are videos. This has been an interesting shift lately, as the most popular content on Instagram used to be images, but Instagram videos are the latest way for brands to engage with their audience. In 2017, the engagement for Instagram videos increased by 53%, surpassing the increase in engagement for images. Engagement is important for businesses as it offers social proof to their audience, increases their marketing reach, boosts brand awareness and is more cost effective than traditional marketing. Brahma Cerveja, Petrobras, and Porto Seguro only posted a couple of times during the analyzed time period, and their results are not very representative of their behavior. Lojas Renner and Banco do Brasil post a good variety of content type. This keeps an audience entertained as they like to see products or services represented in multiple ways. Interestingly, almost 85% of Lojas Americanas’ content consists of images, which is a lot more than the other brands. The amount of daily posts varies a lot between the 10 brands. Even though there isn’t a real rule of thumb for how many times you should post in a day, it’s more about consistency. And, of course, not posting at all will not help you get more followers or interactions. Lojas Americanas posts more frequently than other brands; an average of 9 posts per day, which could be too much for many other brands, as you will normally not get any more interactions if you post excessively. But for Lojas Americanas, this approach does seem to work and I would advise them to keep doing as they are. In the case of Lojas Renner, which has the highest number of followers out of the 10 analyzed brands, they’re posting consistently; an average of 3 posts per day, with sometimes an outlier of 4 or 5 posts, but never less than 3. This is a smart approach, as not posting consistently is limiting your audience and can, in fact, hinder your brand. Petrobras only posted once within the measured time period. With the company being the brand with the second the smallest number of followers, they should actually be posting more. Posting more might lead to higher engagement with their audience and a positive influence on the brand. A profile with little to zero activity will most likely never attract a lot more followers. More likely, the opposite will be the case - losing followers, in fact. The average amount of daily posts for all the brands is 1 per day. This number was pushed up by the high number of posts Lojas Americanas and Lojas Renner made as all the other brands post much less than once per day. Those brands should consider increasing the amount of content they post. 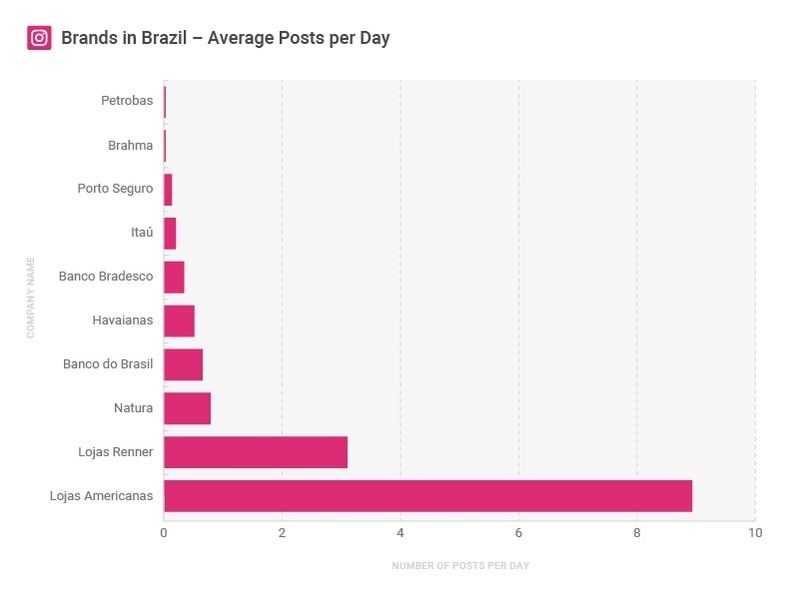 These numbers are taken from the Posts metric and show that Havaianas only posts an average of 0.52 times every day, which considering how high the number of interactions they receive is, they should also consider posting more often to increase their interactions because no posts equals no interactions. 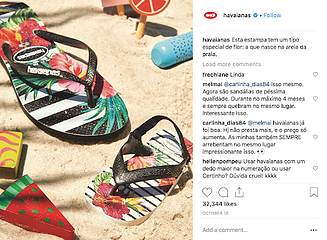 What immediately stands out in the average interaction per post graph above is the high peak of interactions for Havaianas. Knowing that, it is a good idea to dig deeper to discover which content helps to achieve these high results. Interestingly, the content behind these peaks is pretty similar. Knowing what worked is always good for a company itself but also can be insightful for the competition or similar brands. Three of these peaks in interactions were caused by posts including toddlers wearing the famous flip-flops or the tiny flip-flops alone. Apparently, their audience really enjoys seeing these images and that’s why they interact with them so much. With these types of posts, Havaianas found a really good strategy. 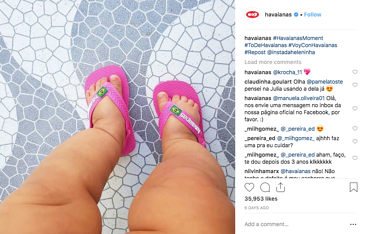 A strategy that also seems to work extremely well for Havaianas is to use content that their own audience has created. This concept is called user-generated content (or UGC), which is a part of influencer marketing. User-generated content is any type of content that has been created and posted online by your fans or other unpaid contributors. If people are posting about your brand on their social media pages, you receive free publicity and posts that fit your audience’s interest. Also, by giving your audience the opportunity to be featured on your Instagram page, you’ll probably receive a lot of UGC posts. People love to be featured on the social media pages of big brands and, therefore, will be very happy to create content for your brand. The audience uses the hashtag #Havaianasmoments to gather all the UGC posts. As a brand, it’s really smart if you take a few minutes every day to find some good UGC content to post on your own Instagram page. While it’ll help you get more interactions, your sales might also get a boost as recent numbers have shown that people are more willing to buy a product if the content is UGC. As a company, you should consider following in Havaianas’ footsteps. Try posting pictures of cute toddlers or maybe even cute old people to increase your interactions. Never be afraid of starting campaigns. Photos of toddlers will certainly not work for every brand but the big takeaway here is test, measure and react, just as I had a look at the peaking interactions and then dug deeper into which content achieved the highest number of likes. Do the same for your page, examine the pages of other brands in your industry, get inspired and test new formats. Considering the growing interest in Instagram in Brazil, it would be unfortunate if your company did not make use of the opportunity to grow your marketing on that social media network. What is notable from these Brazilian brands is that they’re all very willing to perform on Instagram and sell their brand there, but. But despite their efforts to achieve things on the social media platform, they don’t use the opportunities to their fullest potential. Most brands still need to figure out their own strategy and, if necessary, campaigns. If you’re just posting content whenever you can, and without any consistency, chances are high that your efforts have gotten a small number of interactions. The most important thing for most of these companies is that they think about how much they post. It’s often not enough to get a good amount of interactions from your audience. Always strive for more likes and more comments. In short, truly engage your audience with the best (needs to be measured) content possible. Success on Instagram will come.